Often, too often, I feel sad about the cruelty and narrow-mindedness of my countrymen. Lately, they are planning to kill stray dogs in masses, because of the overpopulation. It has been done before and they are planning to do it again, only this time a lot of people have raised to protest against this atrocity. A photo from one of the protests. From www.adoptiicaini.ro. There is a phobia (rational or not) of dogs, especially stray dogs. People mistakenly believe that these are savage beasts, intent on harming humans at any given chance. They often quote the case of a woman bitten by stray dogs who eventually died because of the wounds. They claim it should be a "survival of the fittest" and that for one person, they have to commit genocide. Of course, stray dogs will leave a lot of dirt on the streets and it is unpleasant. Taking care of them in shelters costs quite a lot, so most of them are still out there, in packs, trying to survive. Every person who feeds these dogs is frowned upon (at least). I myself can say that the majority of stray dogs will not attack people unprovoked. None of the ones I've seen (and there are plenty in my neighbourhood) are violent. Most are frightful, which is understandable, and some are even friendly. The only problems we've had were a menacing bark at Aschiuta from dogs protecting their territory. They rarely get close and try to bite her and if I'm alone, they don't even flinch. If we can accept having dogs on our streets, population control can be done through spaying and neutering stray dogs. It is actually cheaper than euthanising the dogs (sterilising costs 15 euros, euthanasia 62 euros). I'm sure readers from more civilised countries agree that is the best solution. 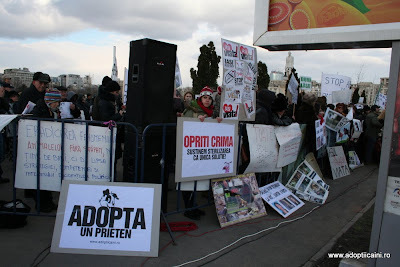 Moreover, the whole action is illegal, contradicting the animal rights here in Romania. There have been two protests against the euthanasia law the past couple of weeks. There is also a petition addressed to the Parliament, asking for the law not to be passed. The petition can be signed online here. Adoption is always a great solution. I cannot stress it enough. Our streets are full of stray dogs needing homes, still I see almost only breeder-bought dogs being walked by their owners. Aschiuta was once on the street too and if we had the means to, we'd adopt another dog too. What we did, others can do too. i've read about the stray dogs in romania and seen quite a few pics on the internet too. sad. neutering/spaying would certainly help and be more humane than culling. education on proper dog ownership would be helpful too. i have a link on my blog to an indian blog where there are often posts about the neuter/spay campaigns in that country. the authorities capture, neuter/spay, tag, then release back onto the streets. there are still problems when they release the dogs into unfamiliar territories. So sorry to hear of the mass culling of dogs in your area. Keep spreading the word about spay/neuter and adoption and you will get enough people together to be heard. This is so sad! Gratefully there are people like you who are making their voices heard! I can not imagine having so many dogs running the streets. It is only something I read about and never see. I guess it sort of blows my mind. So forgive me for being in such a state of shock. It sounds very sad. I honestly couldn't say what I thought was best. Though it sounds like spaying and neutering is at least a humane option. Along with spreading the word about adoption. I hope more people begin to see through your eyes. For the sake of the dogs who need loving homes like Aschiuta. Stray dogs here have always been a problem and a part of our lives. Often, they are better off on the streets, where they get food and water from kind people. The dogs I've seen aren't exactly starving, some almost look well fed. You are doing a great thing by spreading the word.